Because of a throat infection I was already delayed compared to some of the other team members. When Marcus, Stu, Brad B, Marc, Sue and Herb decided to go up to ABC and sleep one night, I was envious like hell, but I had the sense to stay behind in BC and fight off my infection. And so it came to pass under a golden halo sky that all members of the Ama Dablam quest came to meet in Namche Bazaar unimpeded by the ever-present windstopper ninjas. Vanessa bought up the rear and despite her humble denials, credible reports have surfaced that she came to Namche fresh from summiting two further 6000m peaks. Returning from a vacation in Colorado late in September 2005, I had rather few ideas what to do during the next months. My desire was to go back to the Himalayas in order to climb a major peak, but I didn’t have any particular ones on my mind. Ama Dablam, however, had been on my wish list since the autumn of 2000, when I first saw her remarkable silhouette from a small village above Namche. Pyramid Peak (4273m) is often regarded as the most beautiful of the 14’ers in Colorado. It is not as famous as its two neighbors, Maroon Bells, but the foreshortened view of the North Face is neck-binding and unlike anything else in Colorado. I personally “discovered” the peak in 2001, but had to wait 4 long years for the opportunity to climb it. Huron is a shapely, shy peak hidden in the heart of the Sawatch Range about halfway between Buena Vista and Independence Pass in Colorado. Huron Peak just barely rises above 14000 feet but compensates by being the Sawatch fourteener that is farthest away from a paved road. San Luis Peak (4271m) is perhaps the least climbed of Colorado’s fourteeners. The shy peak is far from everywhere and offers little technical excitement. But it is precisely San Luis’ reclusive nature that makes the peak well worth climbing, and I very much enjoyed to spend a beautiful day in solitude. These dramatic peaks guard the San Juan’ northern edge about 15 kilometres west of Lake City in Colorado. Uncompahgre’s great height (4361m) and Wetterhorn’s classic shape make them siren sentinels. The day before I had been admiring those beautiful peaks from a distance, and I was really looking forward to an excellent outing. I did Handies Peak before lunch, and decided to continue with Redcloud (4278m) and Sunshine Peak (4268m) in the sunny afternoon. People often do the two latter peaks in a day, but it’s quite unusual to do all three peaks in one day, as this requires more than 2100 metres gain of elevation in one day. During the long day I also added one more peak on my list, Sundog (4094m). Handies Peak (4282m) is one of the easiest 14’ers in Colorado, but far from boring. The view from Handies’ summit is famous and spectacular and I could see mountains as far as the eye could see. Unquestionably one of my most memorable moments in the Colorado wilderness. Wilson Peak (4272m), Mount Wilson (4342m) and El Diente (4316m) are some of Colorado’s most difficult fourteeners. My approach to these peaks were ill-fated from the first moment, and the problems included closed trailheads, morning thunderstorms, food shortage and insufficient climbing equipment. Mount Eolus (4292m), Sunlight Peak (4285m) and Windom Peak (4292m) are the most remote of Colorado’s fourteeners. These wild, rugged peaks lie buried in the heart of the Weminuche Wilderness in the San Juans. 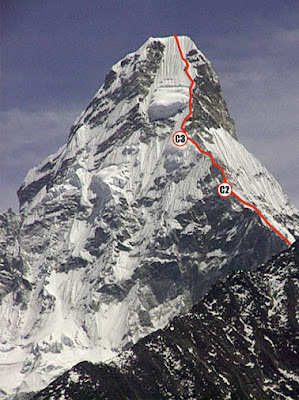 No matter how you approach these peaks, it will be a major undertaking. Mount Shavano (4337m) is the southernmost fourteener in the Sawatch Range in Colorado, and it has a famous snow feature that resembles an angel with up stretched arms. I did not see any angels, simply because it was too late in the season. I was also disappointed to know that the shortest route to bag both Shavano and Tabaguache (4314m) was closed due to environmental concerns. Mount Antero is the 10th highest peak in Colorado and is easily visible from the US285 highway in the Arkansas River Valley. But the mountain has a lot of scars caused by mining activities and road building, so I found it really difficult to appreciate this mountain. Mount Yale, like most Sawatch fourteeners, rises abruptly from its surrounding valleys. No matter how you tackle Yale, the peak will test your legs. Besides it turned out to be a very painful experience for me because of an injury in my left leg/knee. These friendly peaks are close to Breckenridge and nowhere else in Colorado can you get so many 14’ers for so little effort. The Lincoln combination, also called The Decalibron, is a perfect ring around the cirque to bag three official 14’ers in addition to one named but not ranked 14’er (Mount Cameron). Mount Evans and Mount Bierstadt proximity to Denver, makes them exceedingly popular. To simply get away from the crowds, I opted for the seldom climbed east ridge of Mt. Bierstadt, followed by the famous (and more crowded) Sawtooth-traverse to Mt. Evans. Gyantse and Shigatse are two very interesting cities on Southern Friendship Highway in Tibet. We spent some days in both places wandering around in beautiful monasteries and admiring the breathtaking view from the fortress in Gyantse. Southern Friendship Highway between Lhasa and Gyantse was probably the highlight of our entire journey. We cycled through picturesque valleys, challenged high passes and camped next to a holy lake. The Tibetan people, however, are very annoying on this particular area. Jardar Valand has written a very personal account of his meeting with the Tibetan people and culture (Norwegian language only). After 22 days of living in a tent and about 1450 km on the seats of our bikes, we arrived in Lhasa on July 5th. Eric Mortensen has written a report about our journey towards Lhasa in Tibet. You can read it on his blog Full Rulle (Norwegian language only). For a while yesterday evening we were afraid that our whole bike trip to Lhasa was coming to a sudden end. The bolt on Jardar’s rear hub has broken in two. This is a solid steel bolt that was made especially to pull the Bob-cart. We didn’t have a reserve, as none of us thought it would ever break off. But that’s happened. We’re now in Xining, which is the capitol city of the Qinghai Province in China. This city is approx halfway on our bike journey between Ulan Bator and Kathmandu. It was wonderful to get to Hong Kong! Finally a little of the structure and order we’re used to in the West. Now we could safely cross the streets on green, we were no longer in constant danger of falling into an open manhole, and we could enjoy wandering around in smoke-free public buildings and shopping centres. Eric Mortensen has written a report about our journey towards Lanzhou. You can read on his blog Full Rulle (Norwegian language only). During the last week we have cycled through the muslim province of Ningxia, pitched our tents in a nuclear zone, crossed the Yellow River for the second time and finally arrived the huge city of Lanzhou. I suddenly hear a woman’s voice behind me: "Can I ask you some questions, please?" I turn quickly and see three young Chinese women coming towards me. "Of course", I answer right away, thinking to myself: "Wow, somebody I can finally talk to in English, and girls at that!" Eric Mortensen has written a report about our journey towards central China. You can read it on his blog Full Rulle (Norwegian language only). China: You will be fined! Could we bring our bikes into China? That was the big question when we arrived the border between Mongolia and China. It was four nervous guys who woke up in the morning preparing for the challenging border crossing and chinese buraucracy. The biking in Gobi continues in strong tailwinds. But we encounter some problems as well. Our fuel bottles get stolen by some childrens in a village. We also take a wrong road in the desert with scarce water supplies, leaving some of us very thirsty for a whole day. Eric Mortensen has written a report about our journey in the Gobi-desert. You can read it on his blog Full Rulle (Norwegian language only). 20th of April 2005: We are in the middle of a devastating sandstorm approx 20 kilometres south of Saynshand in Mongolia. -This is very bad; we have to find a shelter, one of us shouts. We were supposed to bike on gravel and sand in the entire Gobi desert. So we were rather surprised to see a paved road there. We kept on wondering when the brand new road was going to end. "You are a very lucky man! Very lucky! Super-lucky!" We are sitting in the car together with Kim, who is the owner and manager of UB Guesthouse in Ulan Bator, the capitol of Mongolia. Kim is a talkative South Korean who has been living in Mongolia for ten years. Just moments ago we were in a desperate state of searching around at the airport, and we had a great deal of luck to find one of our bags that was left behind (e.g. forgotten) when our plane arrived Ulan Bator earlier this morning. Problems at Moscow Airport, a forgotten bag at Ulan Bator Airport, cold weather, anti-China demonstrations and one day of snow. This was some of the things that happened when we kicked off the bike-expedition in Mongolia. In March/April 2005 I will travel to Asia together with 3 other guys from Norway. We are planning to go bi-cycling from Ulan Bator to Kathmandu, a journey of 6000km through stunning landscape in Mongolia, China, Tibet and Nepal. The bike trip will take 4-5 months, and we will spend most of the nights in our tents, except from the more populated areas of China, where we can stay in guesthouses along the road and eat delicious Chinese food.